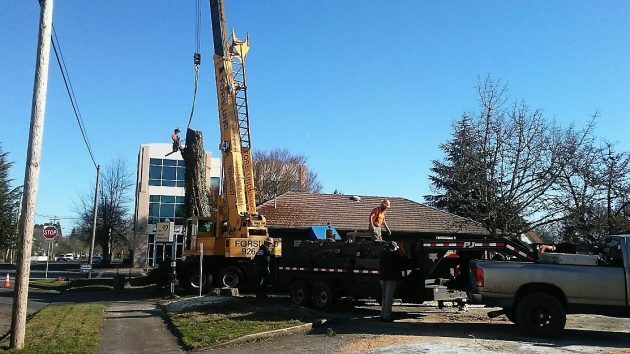 The crew used a crane to lower cut sections of the cedar closest to the Elm Street Pharmacy Sunday. We came across the scene around mid-day Sunday. One of the trees near the Elm Street Pharmacy at Seventh and Elm was already gone, the second was mostly down, and the third was next in line for the chainsaw. One of the crew from Santiam Tree Service told me the tree closest to the pharmacy building, a cedar, had rot inside, which canceled the property owners’ hopes to have the log milled. An undated application to remove the three large trees is on file with the Albany building division. (I found it using the BuildingEye feature under the community development department at cityofalbany.net.) It says the trees were originally planted as part of the landscape but doesn’t say when. One was a Norway spruce that had “structural issues and poor health.” The second, an incense cedar, was “very close to and damaging the building, both foundation and roof.” That’s the one with the interior rot, as I understand it, and if it had failed it would have been a major hazard to the building and presumably people inside or walking by. One needs to remember that trees have a healthy life span and are like us, they mature and start to loose their balance. O loardy, ya mean once at the rest home I outta be on the look out for a guy in a dark hoody with a chain saw looking for “un-balanced” old codgers? And I was looking forward to a niece quiet departure surrounded by those wanted to carve up my estate! The same applies to old buildings. The individual who cuts down trees professionally is a “faller”. In present tense, a faller falls a tree. The past tense “felled” didn’t seem right. Not to be a linguist or, worse, a grammar know-it-all, but fallers don’t fall trees. Unless they fall OFF trees. What they do is to fell trees. When they’re done, the trees have been felled. Unless the wind has blown them down. Then they have fallen. Lived among professional loggers for 40+ years. Gotta go with the vernacular.